This publication is the first in a new series that the Foundation for European Fiscal Studies has initiated. The Foundation, which organizes post-graduate courses on European tax law, aims to encourage research on the economic and legal aspects of tax harmonization and coordination in the European Community. 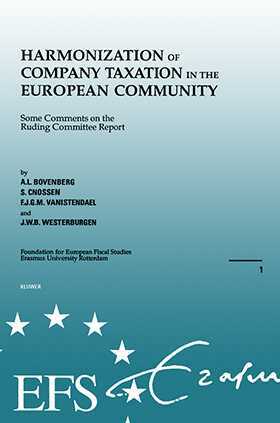 This first booklet is the result of a seminar, organized by the European Fiscal Studies of Erasmus University in Rotterdam, to discuss the conclusions and recommendations of the Ruding Committee, which conclusions and recommendations are the subject of wide discussion. This booklet also contains a summary and introduction prepared by Professor L.G.M. Stevens of Erasmus University. Introduction and Summary. A Personal View. A Better Alternative. A View from the Business Community.